We all think we’re good critical thinkers, that we’re not easily taken in by things and that we have enough sense to sort true things out from false and good arguments from bad. In the same way, everyone thinks they’re an above average driver. ((Iain A. McCormick, Frank H. Walkey, Dianne E. Green. “Comparative Perceptions of Driver Ability–A Confirmation and Expansion.” Accident Analysis & Prevention, Vol. 18, No. 3 (June 1986). pp 205-208)) But not everyone can be above average. That’s not how averages work, but as I said, we’re not good critical thinkers. Not by nature. We have to work at it. Thinking critically means assessing beliefs and decisions with thorough examination, seeking out all of the available information, and ensuring that any conclusion reached is well-reasoned. It involves recognizing bias as it crops up and understanding logic and implication. A someone thinking critically understands how to evaluate evidence and what constitutes evidence. Engaging in critical thinking helps create better beliefs and better decisions, because they’re thoroughly considered and grounded in reason. Considering things critically helps us get at the truth more often. Self-assessment: As the driving study shows, human beings aren’t very good at judging their own progress. We rate ourselves higher or lower than we ought to most of the time when considering our skills, our knowledge, or just how well we did on tests. 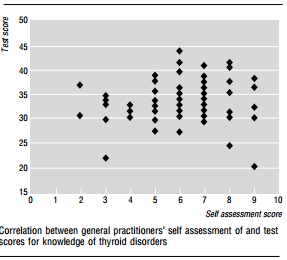 For example, here’s a graph from a study where Australian doctors assessed their own knowledge. ((Tracey, Jocelyn M. et al. “The Validity of General Practitioners’ Self-Assessment of their Knowledge: A Cross-Sectional Study.” BMJ, Vol 315 (Nov. 1997). http://www.ncbi.nlm.nih.gov/pmc/articles/PMC2127907/pdf/9418092.pdf)) Notice that some of the doctors who did worst assessed them selves as doing great, and others who did well thought they did poorly. Achievement is no mark of good self-evaluation. Statistics and probability: We’re not good at judging odds, or understanding how statistics apply to the real world. Sure, most of us learn a bit of probability and stats in high school math, but when it comes to assessing probability, how badly we want the thing is a bigger factor than we realize, ((Wright, W. F. & Bower, G. H. “Mood Effects on Subjective Probability Assessment” Organizational Behavior and Human Decision Processes, Vol. 52, 1992. pp 276-291 http://www.kangsungan.pe.kr/upfiles/dissert/a09_21.pdf)) and with stats we’re not taught about appropriate sample sizes, how to consider outliers, or a lot of the other really important things about applying them in real life. Recognizing bias: If you take a look at the two studies I linked above (they’re short, only a couple of pages), you’ll notice that one of the common threads is that we don’t know when we’re making errors and exercising biases. While we’re often quick to recognize these in others sometimes, we’re not good at spotting it in ourselves. I keep saying you’re not a good critical thinker, but the truth is, you might be. What I’m trying to get at is that you’re not good enough to avoid these kinds of things all the time. Neither am I. Neither are my professors, who have been doing this for a lot longer than I have. But thinking “I’m a good critical thinker” can lead us to rely on our good sense which, as you’ve seen, isn’t good enough, though you may have it in good supply. I think that, with regard to critical thinking, your worst enemy is the complacency which your own good sense engenders. Now that the formal logic posts are wrapping up, I’m going to move on to some critical thinking on Saturdays, starting with recognizing logical fallacies and moving on to other biases. Also, please let me know what you think of the footnoting. Jim, so which is it? Am I a good critical thinker or am I not? Frankly, I’m pretty sure that I’m not. And thank goodness for that. I’m not sure I would have the motivation to get up in the mornings if I were completely honest with myself. The truth is we all need some rose-coloured glasses (call it “optimism” if you will) in order to function. And I definitely would never drive again if I knew just how bad a driver I probably am. Why would not being a good critical thinker be demotivating? It’s just something to improve at, and we can do that through learning, like becoming familiar with common fallacies, or through technology, by taking the time to check sources and look up facts. We have tools that we’ve developed to help us deal with these things, like independent assessments, anonymous reviews, infographics and the like. I’m not arguing that critical thinking is impossible, merely that none of us is as good at it as we might like to believe, and that believing we have enough good sense to suss things out is a barrier to improving. As for driving, if it’s a concern. why not learn to drive better? As someone who doesn’t know how to drive, I’m not really in a position to comment on anyone’s driving, but it seems like that’s the answer. You may not be in a position to assess yourself as a driver, but driving instructors certainly would be.